Hello garden gals and guys! Well, this past weekend was a pretty wet one, but I managed to get a small harvest in between the rain drops. I was going along growin' my broccoli and it was looking good. 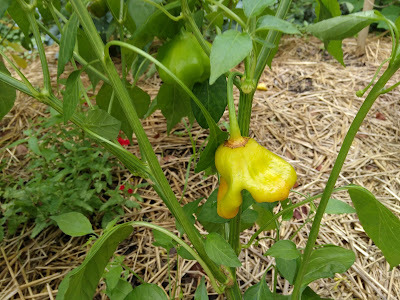 Little heads were starting to form. They were beautiful. Were. Almost overnight I lost all my broccoli to the cabbage worm. I went out to check on them and there were all these holes all over the leaves. 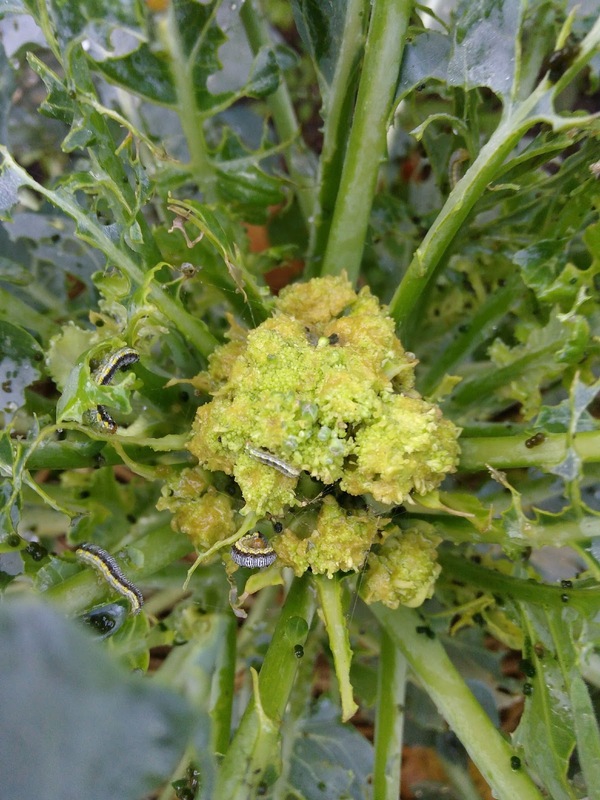 When I looked a little closer, the broccoli was covered in cabbage worms. Here's a close-up of the little jerks. 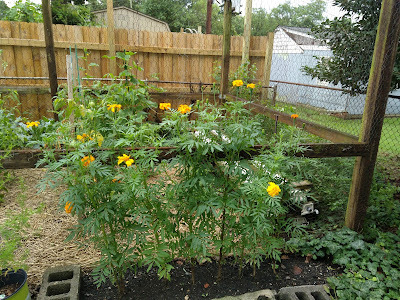 My camera phone isn't the best, but here is another shot of one of the plants. 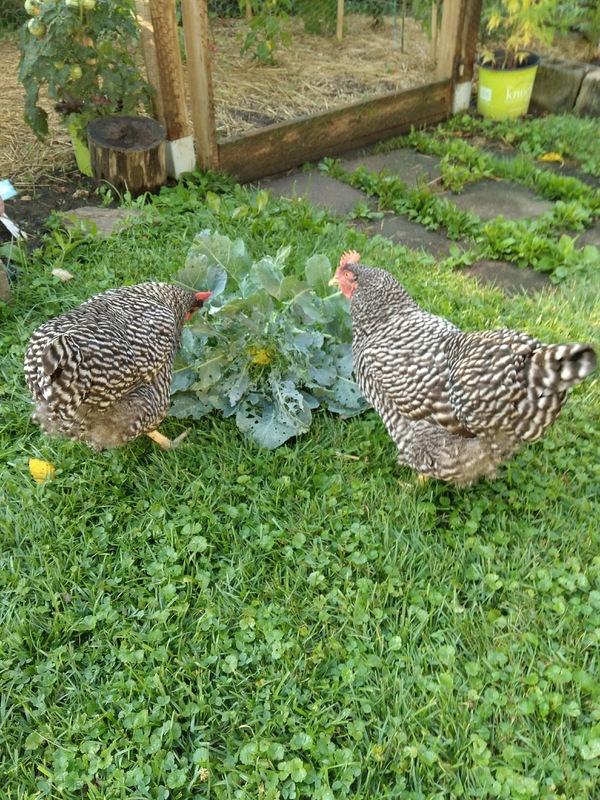 What you can't see is the worms all over the broccoli. Everywhere. 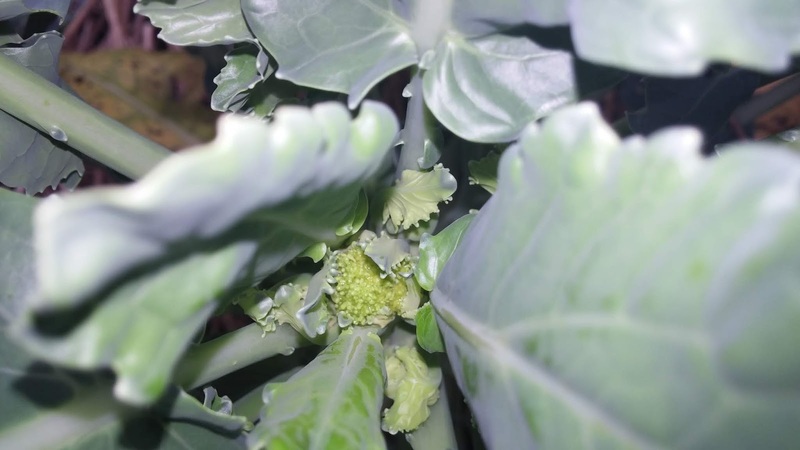 On this plant you can see them all over the head of the broccoli itself. 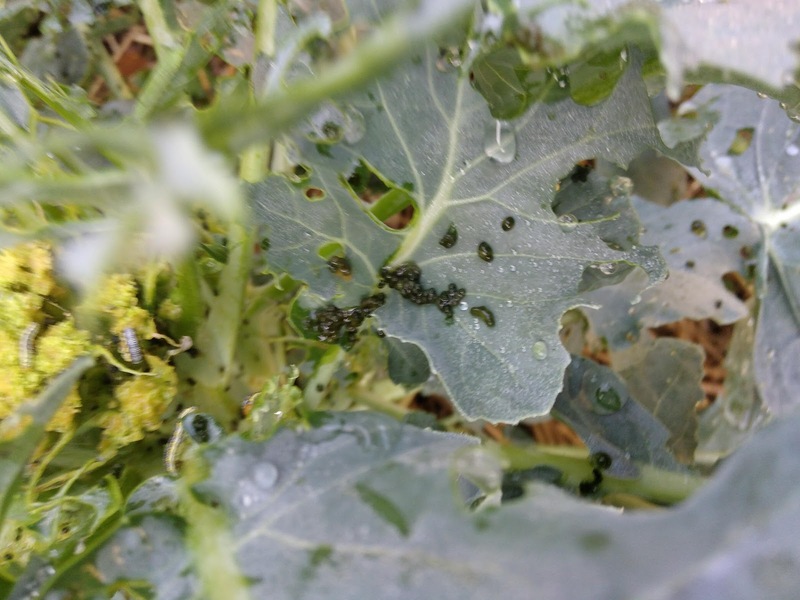 The little black dots you see below are cabbage worm eggs. The plants were also covered in these. You can usually take care of cabbage worms by sprinkling BT or diatomaceous earth. Since my plants were covered in just as many eggs as worms, I got rid of the plants entirely. I don't need any more worms hatching in my garden. So, no broccoli right now. I may try to start some seeds again in August to see if I can get a fall crop. 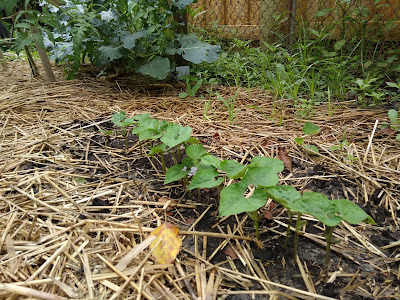 If I do, I will put the broccoli under row covers to keep the worms at bay. On a side note, if you ever see little white moths flying in your garden and you think "oh how pretty," don't be fooled. 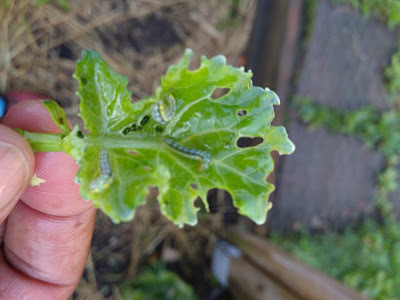 That's the moth that lays the eggs that hatch into cabbage worms. If you see them, try and catch them and kill them. 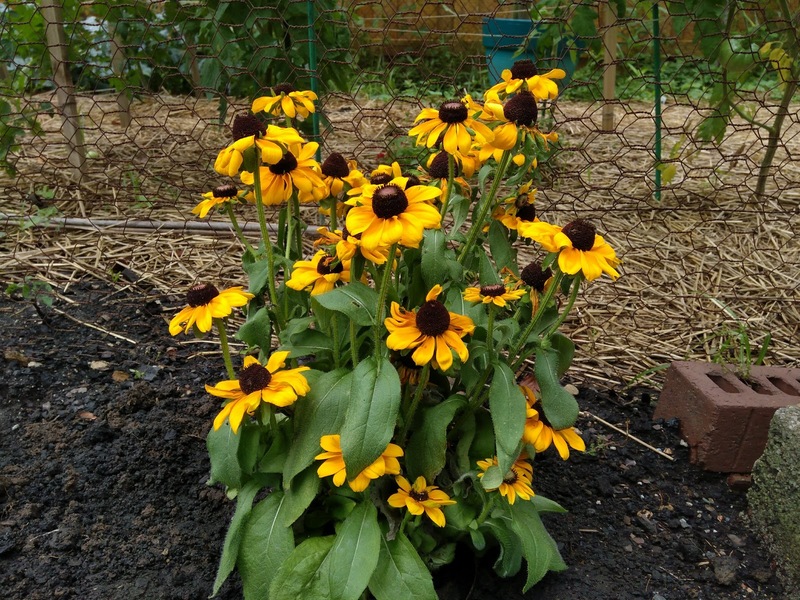 They are no good for your garden. At all. The only good that came out of this garden guffaw is my girls LOVED the worms. Every. Last. One. That'll teach those worms. I didn't want to end my post on such a sad note. 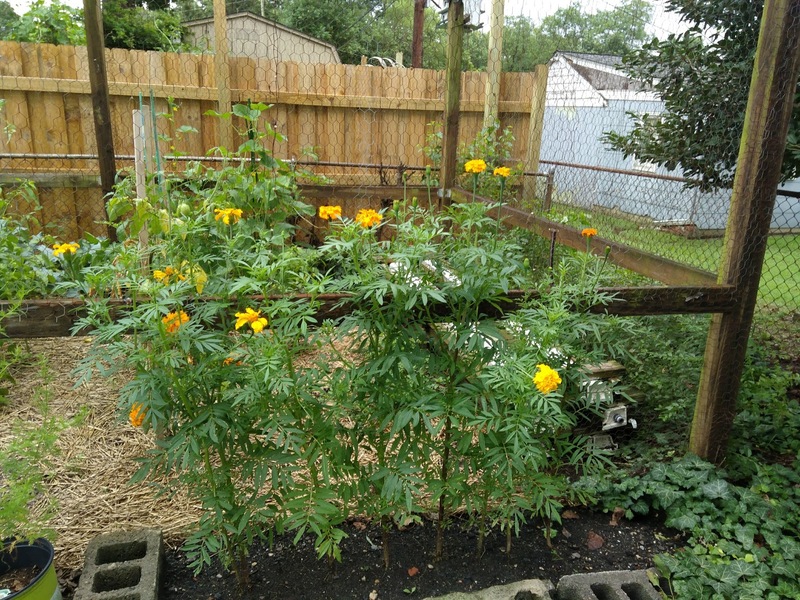 So here are some progress shots of my garden. 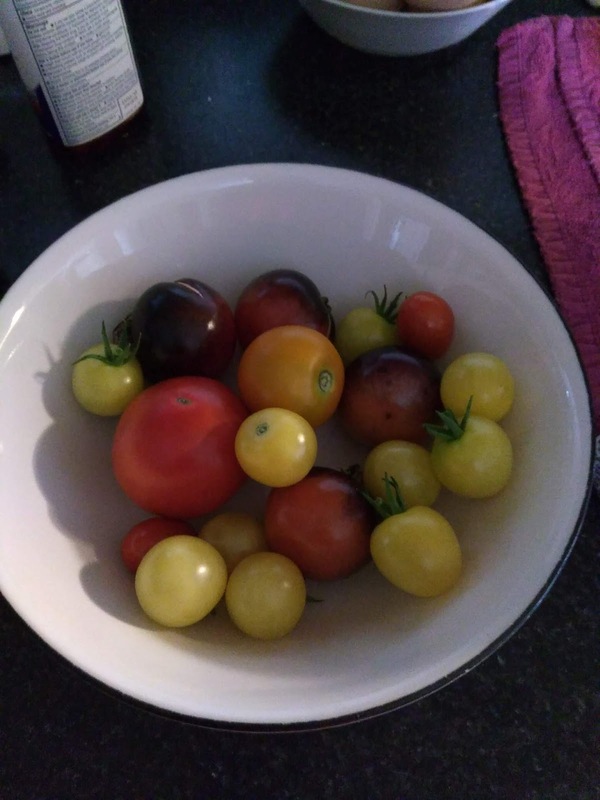 This is a nice little tomato harvest that my hubby enjoyed as a snack in his lunch. They were all so sweet it was like eating candy. I started some more beans. 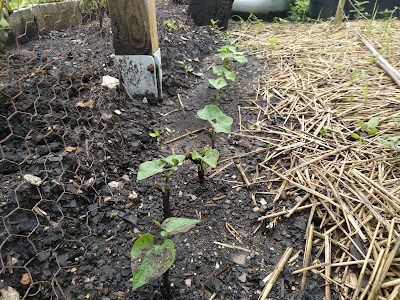 These are called Cherokee Trail beans. It is an heirloom bean. It was carried over the Trail of Tears by, obviously, the Cherokee. The bean is greenish purple and has dark black seeds. Next up is a Calabash. 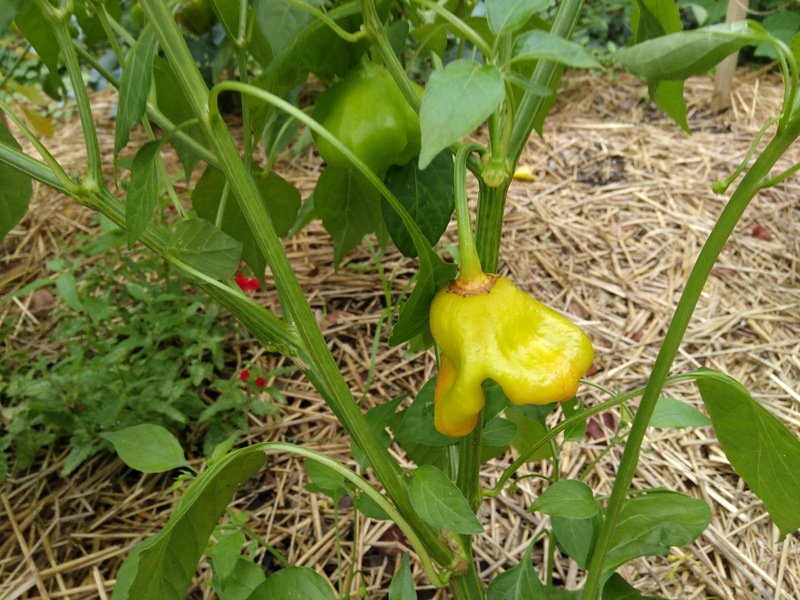 This one is almost ready to be harvested. My mouth is watering already! 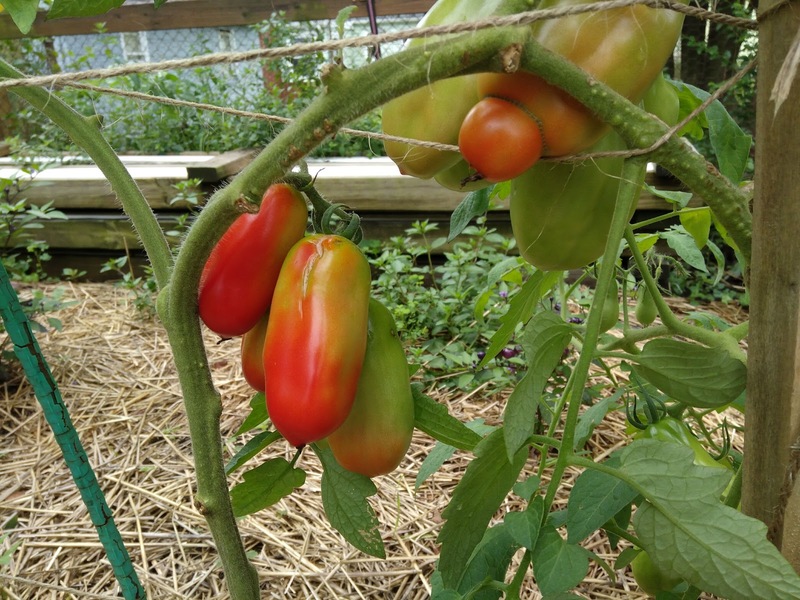 My plum tomatoes are taking their sweet time ripening. I wish I could hurry them along. I have sauces to make and can for the winter! 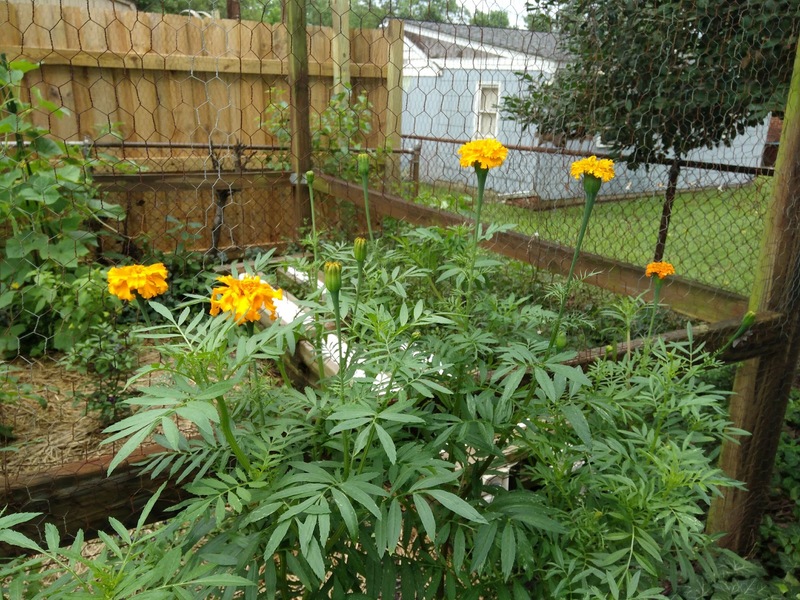 My African marigolds that I planted decided to be extra and grow four feet tall before they finally gave me flowers. I welcomed our state flower, the Black-eyed Susan to my raised bed. They were on the clearance rack at my co-op for a few bucks. It was buy one get one free so I figured why not?? So, that's all folks! We're supposed to get liquid sunshine all this week. After all the rain we got over the weekend, I can't say that I'm too happy about the coming weather. But what can we do? I'll just have to keep an eye on my tomatoes. They like to crack when they get too much water. I am so sorry about your broccoli Ms. Audra. 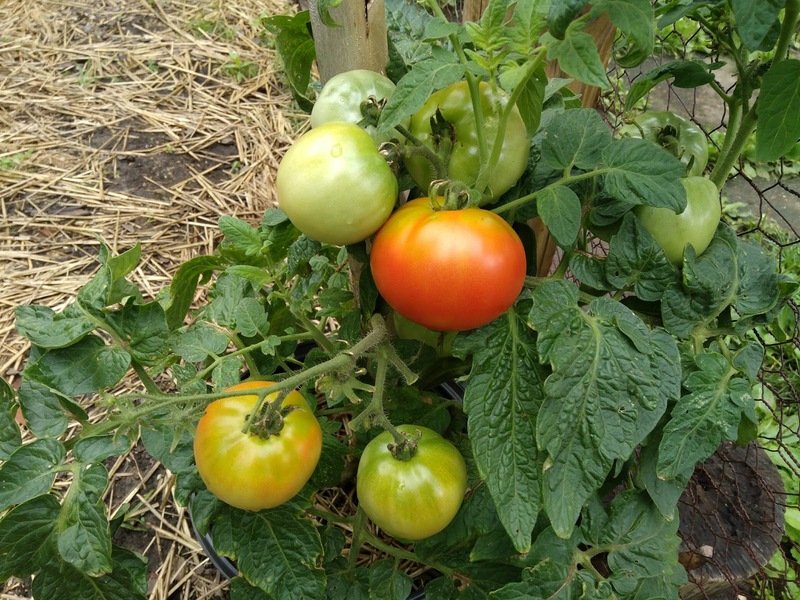 But your tomatoes look amazing - lucky you! My Romas keep flowering but I've only gotten 2 tomatoes out of it. 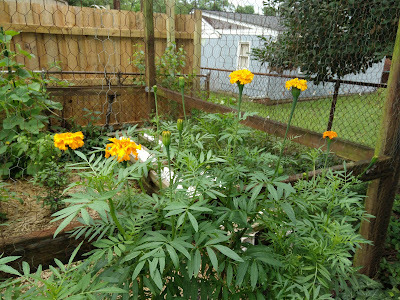 On a side note, all of my marigolds are getting really tall - a few are even waist high - but none have started to flower yet. Hopefully soon. There's also a potted amaranth that's as tall as I am - it just started to bud last week. Hey there, Nikki! Thank you for stopping by. 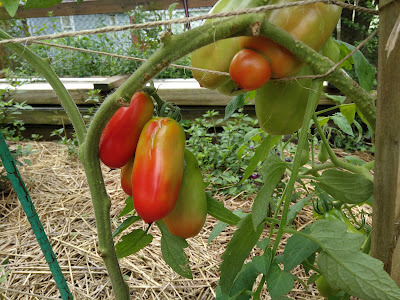 I'm wondering if I will even be able to make any sauce since my tomatoes seem to be ripening only a few at a time this year. Gardening is such a battle at this stage. But, as you said, you gotta love it! I didn't realize the little black specks on the cabbages were eggs! Good to know. One year I had an excess of thyme growing and I chopped a bunch of it and sprinkled it on my cabbages. 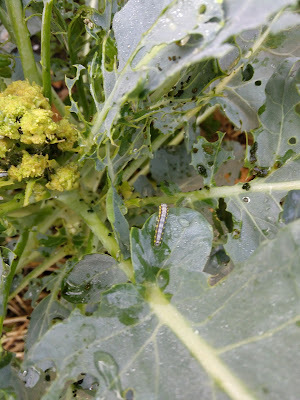 The cabbage moths didn't like that and stayed away! Your garden looks really good. Beautiful soil and I love seeing all that mulch. 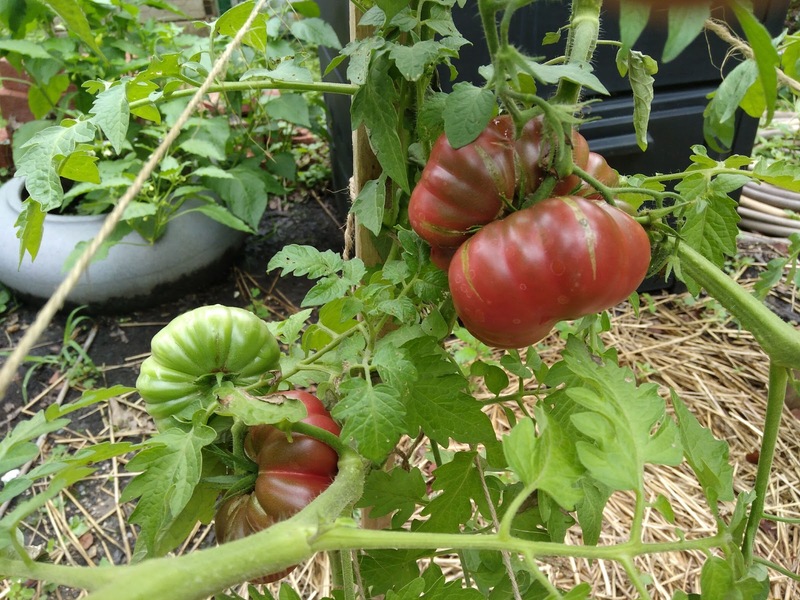 My tomatoes usually piddle along too, so I freeze them as the ripen and then make my sauce after gardening season is over. Hi, Leigh! I've never heard of sprinkling thyme on cabbage. I'll have to try that! That's a good idea with the tomatoes, too. I can blanch them and food-saver them and make sauce when I need it. That saves me from having to can in the heat of summer, too!